British “it” brand Whistles is teaming up with jewelry designer Madeleine Moxham for a limited edition capsule collection due out October 26. The range stays true to Moxham’s aesthetic — utilitarian details and hardware-like flourishes, all in a monochrome palette. The collection has the kind of products that you can truly figure out a way to wear with anything. Leather straps, metal rivets and geometric shapes are the name of the game for this offering. You’ll find leather and cut steel bracelets, headbands with leather straps as well as necklaces with detachable pendants hanging from trigger hooks. 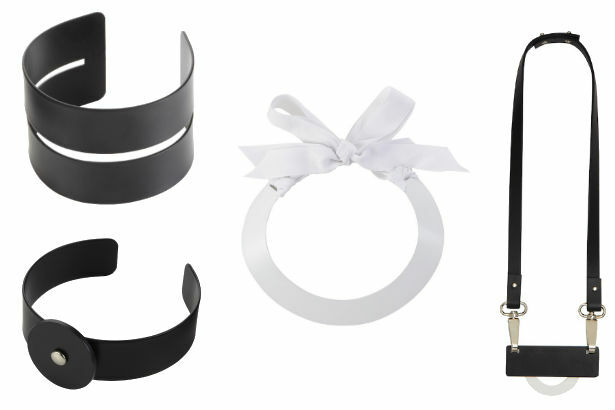 If you’re looking for something even simpler, sleek collar necklaces in either black or white with a ribbon tie may tickle your fancy. Lucky U.K. residents will be able to shop the collection starting Sunday, though the collection will also be available through the Whistles website. Prices start at £35 ($56 USD) for a leather clip and peak at £95 ($152 USD) for a necklace.